Masala Bati - Stuffed Masala Bati - Bharwa Masala Baati is a very popular Rajasthani dish. 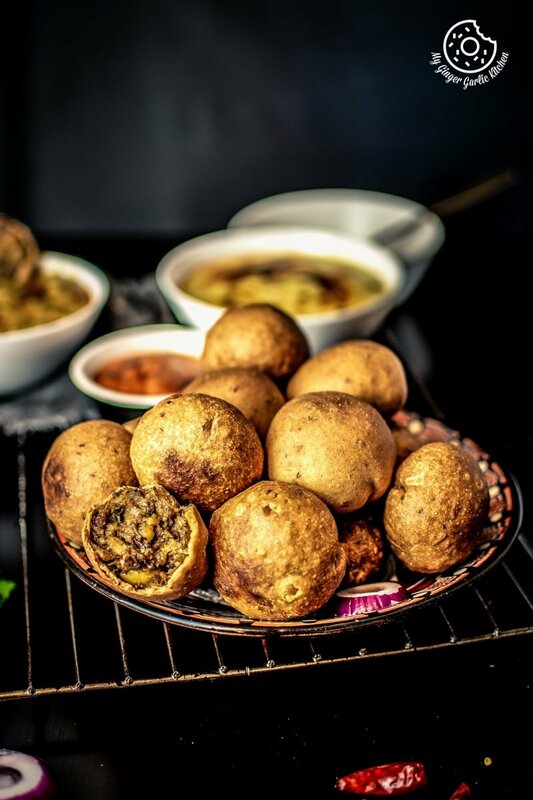 Masala Bati is a stuffed dumpling which is either deep fried or baked in a bati oven. This easy to make ‘masala baati’ is prepared with very basic ingredients, and tastes delectable. This version of masala baati has a deliciously spicy stir-fried potato (aloo) masala filling. As a native Rajasthani, batis (baatis) were a part of my life and still is. This meal of Dal Bati Churma was a frequent flyer at my home. There are some meals you can’t live without, and ‘dal baati’ is one of such meals for me. You can check out more Rajasthani recipes here! Masala Bati or Bharwa Masala baati is a speciality from Rajasthani cuisine. This delicious stuffed dumpling is made using whole wheat flour (atta) and spicy potato filling (aloo ka masala). Masala Bati is either baked or deep-fried. Plain Baati: is plain dumplings which are baked. 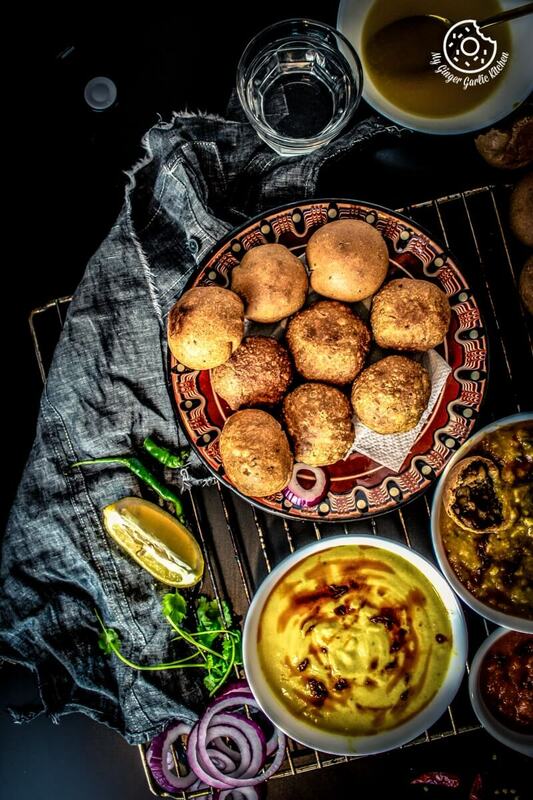 Bafla Baati: is first boiled and then baked. 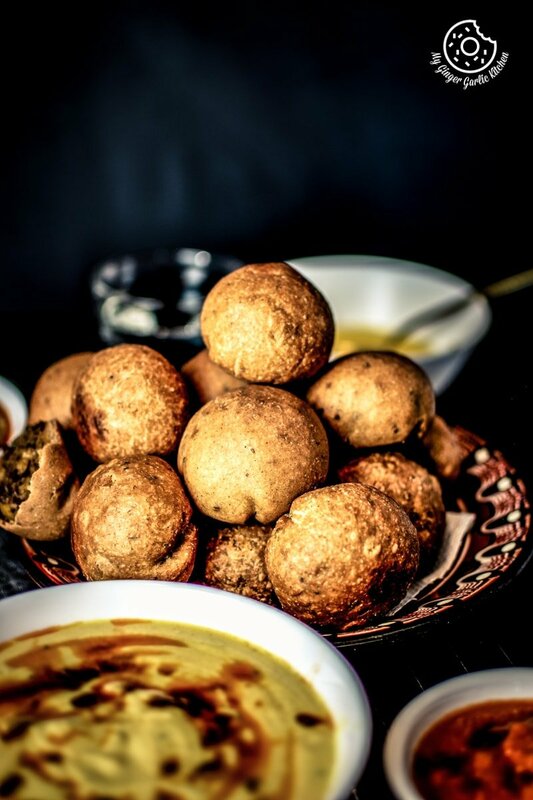 Makke (Cornmeal) Ki Baati: is made using cornmeal. Masala Baati: is made in two ways. Stuffed and non-stuffed. Non-stuffed version is prepared with grounded spices mixed with the flour. It can be Baked or deep-fried. There are mainly two types of masala baati. Let’s talk about Stuffed (Bharwa) Masala Baati. The very popular Bharwa masala bati you will get in Rajasthan is ‘Aloo ki Bhrawa Masala Bati’. This baati has a spicy, boiled and stir-fried potato filling. Then there are two other versions of masala baati which are not very popular as Aloo ki Bharwa Masala Bati. These two other versions are made with green peas (hare matar) filling and gram flour (besan) filling. Stuffed bati filled with spicy green peas mixture is known as Matar ki Bharwa Masala Bati and gram flour (besan) filling is known as Besan ki Masala Bati. Is boiling needed for this masala Bati? No, this is not required. I would not recommend boiling masala bati if you want to make it in an authentic and traditional way. Boiling would make a glaze on batis and this would take away the authentic taste. I know some recipes call for boiling masala bati before baking or frying them. However, I never boil my bati, because that is not the authentic way — have never had masala bati which is boiled. We Rajasthanis only boil ‘Bafla Bati’. 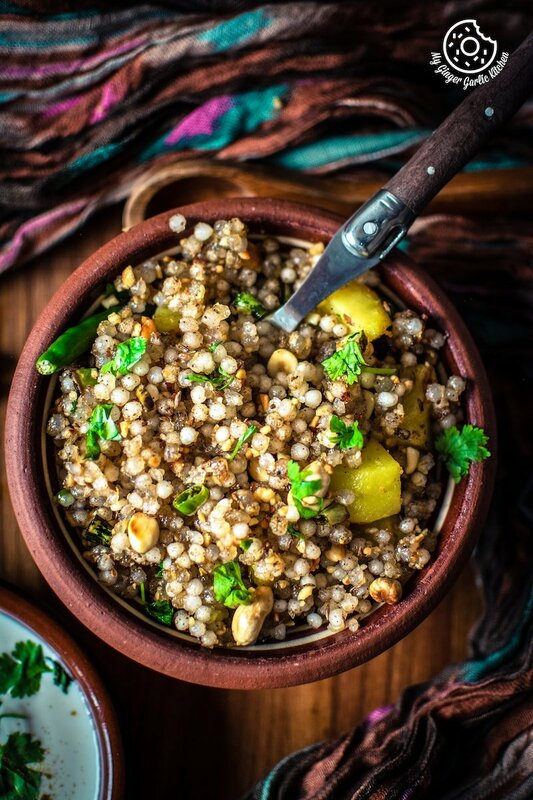 How do you cook traditional masala bati? 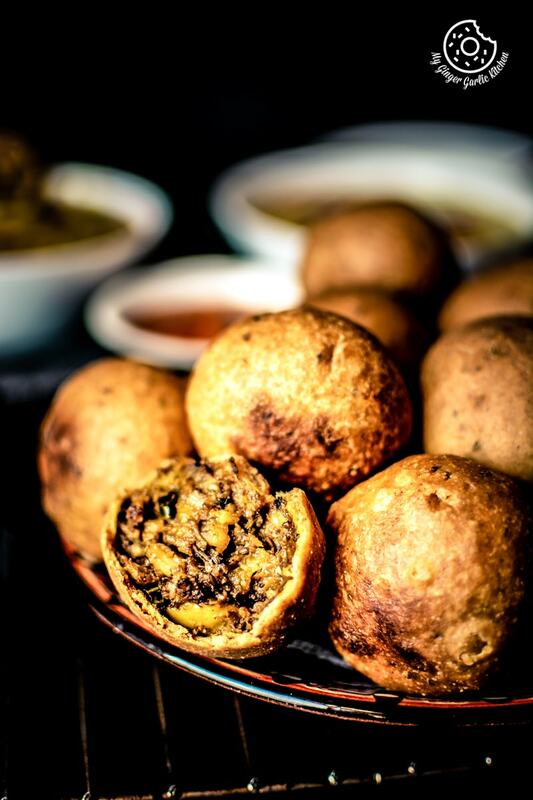 Traditional masala baatis are either deep fried or baked. For baking, there are various techniques. 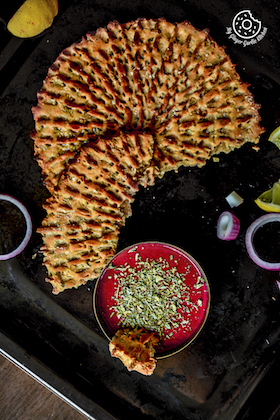 Batis can be baked in a Tandoor (a traditional clay oven), in a baati oven, or in a regular oven. In some parts of Rajasthan (especially rural parts), baatis are also cooked using Uple/Kande (cow dung cake). You will get the different taste with each and every diverse cooking process. No matter which way you choose to cook the batis, they would always taste great. Below, in the recipe box, I have given both the versions (deep-fried and baked). How to serve Masala Bati? 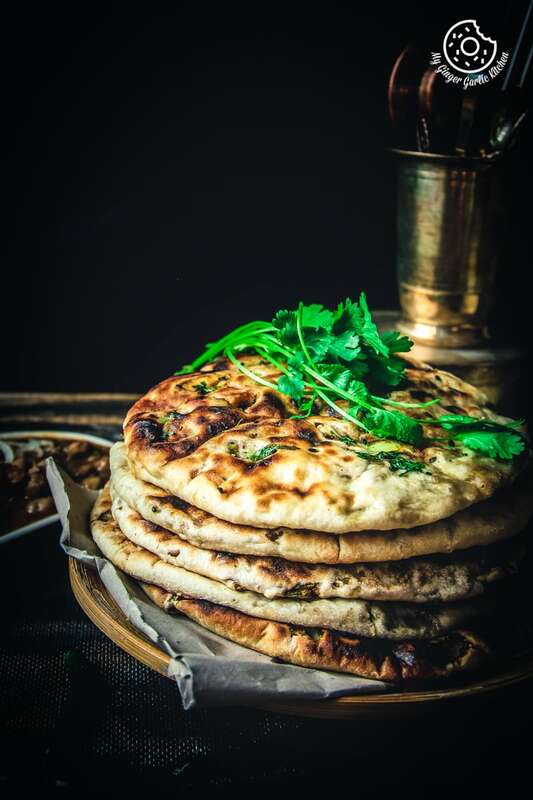 If you want to have that original Rajasthani feel and want to have it the traditional way, then I would recommend serving it along with panchmel dal, gatta curry, lehsun ki chutney, kala chana kadhi, and masala chaas. This heartwarming Masala bati also tastes awesome the way they are. You can also enjoy them as a snack along with some chutney. How to make Rajasthani Masala Bati? How to make potato masala for masala bati? Dry roast 5-6 cloves and 7-8 peppercorns for 1-2 minutes. Once roasted, crush them coarsely using a mortar pestle. Heat the oil in a non-stick pan. Once hot, add coarsely powdered cloves and peppercorns, crushed coriander seeds, the cumin seeds, and asafoetida. Saute for 1 minute. When the seeds crackle, add the chopped ginger, chopped green chilies and saute for 1 minute. Add chili powder, turmeric powder, garam masala powder, coriander powder, amchur powder, and salt. Mix everything well and fry for few seconds. Add cashews and raisins and saute for 1 minute. Add boiled and mashed potatoes and mix well. Cook on medium heat for 2 to 3 minutes. Keep stirring continuously, mash well with the back of a spoon. Add coriander leaves and mix well. Turn off the heat and transfer masala on a plate. Let it cool completely. Once cooled, divide the stuffing into 13-14 equal portions and roll them into balls. Keep them aside. How to make dough for masala bati? For making the dough, add whole wheat flour, semolina, salt, baking powder, baking soda, carom seeds (ajwain), oil/ghee to a bowl. Mix everything well until crumbled. Add warm water and knead into a firm dough. Apply little oil/ghee on the prepared dough and keep it covered for 30 minutes. How do you shape masala Bati? Once the dough is rested for 30 minutes, divide it into 13-14 portions. Shape each portion into balls. Roll into a 2-inch diameter circle. Place 1 stuffing ball in the center. Bring together all the sides, seal it tightly. Then remove the excess dough. Roll it again. How to fry Masala Bati? Heat oil/ghee in a deep pan. Once hot, turn the heat to medium and deep-fry batis until they are golden and crispy. How to bake Masala Bati? Preheat oven to 175°C/350°F. Arrange prepared stuffed baatis on a lined baking tray. Bake for 30-40 minutes or until they are crisp and golden brown. Dunk them in ghee. Traditional masala bati is fried in ghee. But you can replace ghee with oil. Baking powder is only needed for baked bati. If you are planning to make fried batis then you can skip baking powder. Coarse whole wheat flour (mota gehun ka atta) is used in traditional recipes. I don’t get coarse whole wheat flour where I live, that’s why I use semolina. It gives that same coarse texture to the dough. But if you have coarse wheat flour, then semolina can be avoided. You can also add some boiled green peas to aloo masala. This is a hot recipe, so feel free to reduce the amount of chili powder and green chilies. Some yogurt can also be added to the dough. Never roll baati dough too thick or too thin. If you roll it too thin then batis would break while frying and if you roll the dough too thick then the bati won’t cook properly from inside. Always fry bati on medium to low heat and fry until the crust is golden and crisp. This masala bati takes longer time to deep-fry, so keep that in mind. 1. Add 5-6 cloves and 7-8 peppercorns to a pan. 2. Dry roast for for 1-2 minutes over medium-low heat. 3. Once roasted, crush them coarsely using a mortar pestle. Set it aside. 4. Heat 2 tablespoons oil in a broad non-stick pan over medium heat. 5. Once the oil is hot, add coarsely powdered cloves and peppercorns, crushed coriander seeds, the cumin seeds, and asafoetida. Saute for 1 minute. 6. When the seeds crackle, add chopped ginger, chopped green chilies and saute for another minute. 7. Now add chili powder, turmeric powder, garam masala powder, coriander powder, amchur powder, and salt. 8. Mix everything well and fry for few seconds. 9. Add cashews and raisins and saute for 1 minute. 10. Add boiled and mashed potatoes and mix well. 11. Cook on medium heat for 2 to 3 minutes. Keep stirring continuously, mash well with the back of a spoon. Add chopped coriander leaves and mix well. 12. Turn off the heat and transfer masala on a plate. Let it cool completely. 13. Once cooled, divide the stuffing into 13-14 equal portions and roll them into balls. Keep them aside. 1. For making the dough, add whole wheat flour, semolina, salt, baking powder, baking soda, carom seeds (ajwain), oil/ghee to a bowl. 2. Mix everything well until crumbled. 3. Add warm water and knead into a firm dough. 4. Apply little oil/ghee on the prepared dough and keep it covered for 30 minutes. 1. Once the dough is rested for 30 minutes, divide it into 13-14 portions. 2. Shape each portion into balls. 3. Roll into a 2-inch diameter circle. 4. Place 1 stuffing ball in the center. 5. Bring together all the sides, and seal it tightly. 6. Then remove the excess dough. Roll it again. 7. Repeat steps 3 to 6 to make 13 more batis. 1. Heat oil/ghee in a deep pan over medium heat. 2. 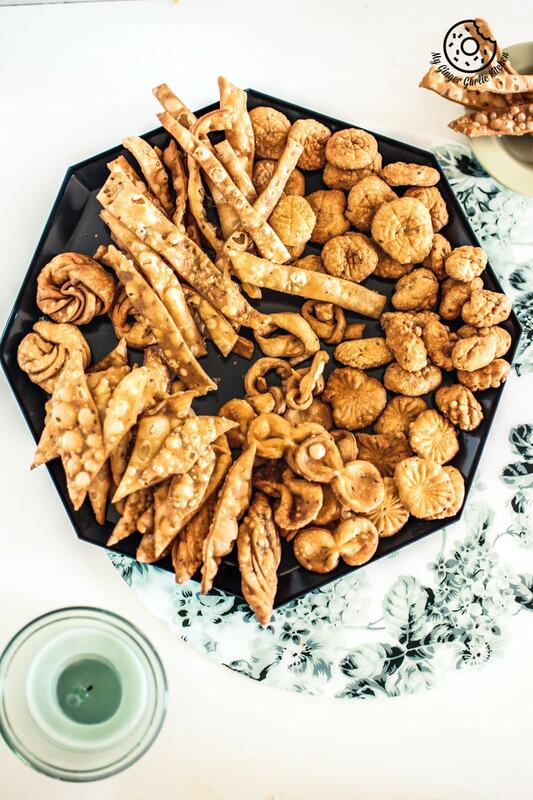 Once hot, turn the heat to medium-low and deep-fry batis until they are golden and crispy from all the sides. 3. Drain on an absorbent paper and fry more batis. 4. Serve hot masala bati with dal and Chutney, and churma. 1. Preheat oven to 175°C/350°F. 2. Arrange the prepared stuffed baatis on a lined baking tray. 3. Bake for 30-40 minutes or until they are crisp and golden brown. 4. Dunk them in ghee for 1 minute. 5. Drain on an absorbent paper. 6. Drizzle with some more ghee and serve hot masala bati with Dal, and mirchi ke tipore (green chili pickle). 1. This is a hot recipe, so feel free to reduce the amount of chili powder and green chilies. 2. Baking powder is only needed for baked bati. If you are planning to make fried batis then you can skip baking powder.